I would like to thank Brian and Kathy Knechtel for providing Lucknow with a wonderful grocery store for 29 years and for selling over 500 of my cookbooks while refusing to accept any commission or discount. Without their support Anne’s Favourites would have been a huge disappointment. Instead, it has given me more joy than I ever would have imagined when I printed and published it. I am sincerely grateful to them and the other retail locations that have carried my book and the over 13oo people who have purchased it! I needed a gluten-free, vegan brownie recipe for my niece’s shower and found two excellent recipes. 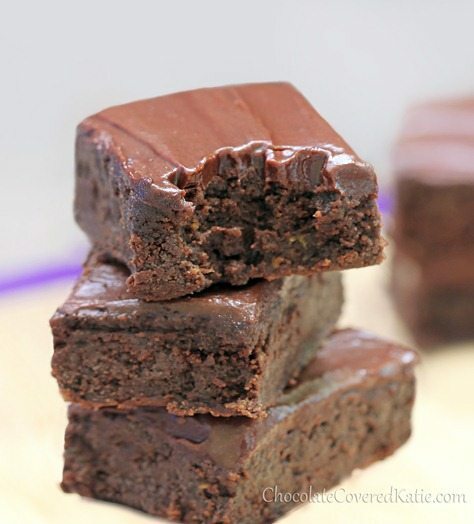 Vegan, Gluten-free Black Bean Brownies from the Minimalist Baker – Who would believe that a can of black beans and some cocoa could taste this good!! I apologize for being so long without a blog. It has been a whirlwind for me starting with the Lucknow Fall Fair in September. As soon as the Soap Box Derby was finished on Sunday we headed to Toronto to catch a flight to Chicago for the International Celiac Disease Symposium (ICDS). I found the presentations at the Canadian Celiac Conference in Toronto so informative that I decided to attend the International Symposium when it was relatively close to home. It was incredible to have the opportunity to hear the foremost researchers share their current insights into the diagnosis, etiology and treatment of celiac disease and gluten-related disorders. I plan to share my thoughts on the information presented at the ICDS when I have time to organize them and check the accuracy so they make sense to you. Until that happens I am continuing to do what I know best – adapt “Anne’s Favourites” recipes into awesome gluten-free versions. Please continue to read about the Pumpkin Chiffon Cake I made for my Mom’s 84th birthday.